You would not believe this unless you have already seen the hundreds — if not thousands — of documented cases where the OOXML process had been abused. Some of them, Jesper Lund Stocholm for instance, are Microsoft partners and fans [1, 2, 3, 4, 5, 6, 7]. This is a joke, right? And Alex Brown [1, 2, 3, 4, 5, 6, 7, 8, 9, 10, 11, 12, 13, 14, 15, 16, 17, 18, 19, 20, 21]? Should they also bring Fidel Castro in to cast a vote on democracy? Additionally, be sure to learn who Adam Farquhar is [1, 2, 3, 4, 5, 6, 7, 8, 9, 10, 11]. Isn’t he also with Microsoft and the British Library? This is ridiculous; it’s a syndicate of money and influence taking over shell establishments like ISO. Some of these people trade Microsoft products for a living! “Microsoft (and its ecosystem) is set to decide on Microsoft (and its ecosystem).”Let’s pick some other examples. It’s most amazing how Microsoft employees are ‘dressed up’ as ECMA employees. Doug Mahugh at ECMA? He works for Microsoft. Is he swapping hats for cover-up? Again? What is ECMA doing there anyway? ECMA is being paid handsomely by Microsoft. 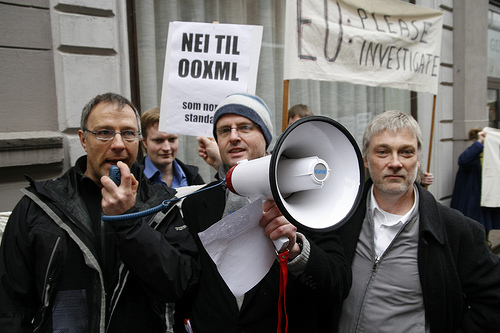 Remember Jan van den Beld, who changed directives especially for Microsoft and then left ECMA to join a Microsoft lobbying arm and behave even more aggressively? How about Rex Jaeschke? Follow the links at will. It’s all too clear to see what is happening here. At the moment, Rick Jelliffe [1, 2, 3, 4, 5, 6, 7] accuses concerned people of being “afraid of openness”. He refers to OOXML, which is definitely not open. In fact, the word “Open” in the acronym should be forbidden given all the binary components which are undocumented, not to mention allergy to open source software (Microsoft reserves the right to sue open source implementations over OOXML-related patents it applies for). One could go on and on analyzing one person at the time, or at least those who attend to serve Microsoft. The motives say it all. Microsoft (and its ecosystem) is set to decide on Microsoft (and its ecosystem). Remember how Bryan complained and prematurely left ISO after a long career there, having witnessed how his committee got stuffed by Microsoft? He even spoke out about it. Be sure to view this list of the attendants at the OOXML BRM. It’s equally appalling, just like the BRM itself [1, 2, 3, 4, 5, 6, 7, 8, 9, 10, 11, 12]. it was controlled by ECMA, Microsoft and some other OOXML-sympathetic figures. ISO is being abused by Microsoft and its affiliates that exploit ISO for their wallets. To make matters worse, ISO chose to try and bury all of this under the rug. This makes it an accomplice in a sense. You could take a rich crook and put him in a suit. But it’s still a crook in a suit, who probably made a fortune ‘thanks’ to bad behaviour. This must not be tolerated. Despite all of these dirty tricks, ODF is going strong. Yesterday we wrote about NATO and ODF without sufficient certainty. It’s finally more official, based on Andy Updegrove’s Web site and even Heise. NATO has included the International Standardization Organization’s (ISO) certified Open Document Format (ODF) in its list of mandatory standards to promote interoperability. NATO’s standards list includes Rich Text Format (RTF), extensible markup language (XML) and Office XP formats as requirements for the sharing of data. ECMA is an association of computer manufacturers, and has very few actual employees. Most people doing work on the various ECMA “standards” efforts are made up of representatives of it’s member companies. There is no effort that I know of to disguise the fact that Microsoft employees are doing Microsofts work via participation in ECMA’s efforts on DIS29500.